June is Alzheimer’s and Brain Awareness Month, which seemed a particularly apt time to talk with Rich Taylor, a University of Notre Dame researcher whose research focuses on the discovery and development of new therapeutic leads for the treatment of unmet clinical needs in a number of diseases, including Alzheimer’s. 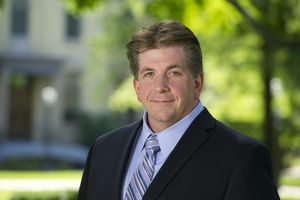 Taylor is associate vice president for research, professor of chemistry and biochemistry and interim director of the Warren Family Research Center for Drug Discovery and Development. How would you describe your Alzheimer’s research? My lab investigates the therapeutic potential of compounds produced by bacteria and develops new methods for their production. Through both biological and chemical routes we have been able to generate compounds that are potential leads for Alzheimer’s disease and frontotemporal dementia (FTD). Recent clinical studies have offered strong support that a dysfunctional protein called Tau is the driver of cognitive decline in Alzheimer’s disease. It has been shown by researchers at the University of Pennsylvania that compounds called microtubule-stabiliizing agents (MSAs) have beneficial effects in mouse models of the disease. Researchers in my lab at Notre Dame have identified new MSAs that efficiently cross the blood brain barrier and may be a value lead for Alzheimer’s disease. Through a collaboration with researchers associated with the Bluefield Project, we are also investigating a second set of compounds for FTD. Why did you decide to pursue Alzheimer’s research? Early in my career, our studies were motivated by a desire to contribute to chemistry at fundamental level. But more recently, I have been inspired by a desire to have impact beyond science and beyond training by focusing on unmet clinical needs. In the specific case of our Alzheimer’s disease and FTD studies, I have been deeply influenced by my mother’s dementia and the difficulties it places on the daily lives of her and my dad. I am confident that at some point in the future this will no longer be an issue. Until then, I will do what I can to either shed further light on the fundamental aspects of the disease or identify novel compounds as potential therapies. Where do you do your Alzheimer’s research? My research group is a part of the Warren Family Research Center for Drug Discovery and Development, and for the past 20 years has worked in Stepan Hall of Chemistry and Biochemistry. We are grateful for the generosity of Notre Dame alumni who have enabled us to look forward to our move into McCourtney Hall next summer. Originally published by William G. Gilroy at news.nd.edu on June 26, 2015.